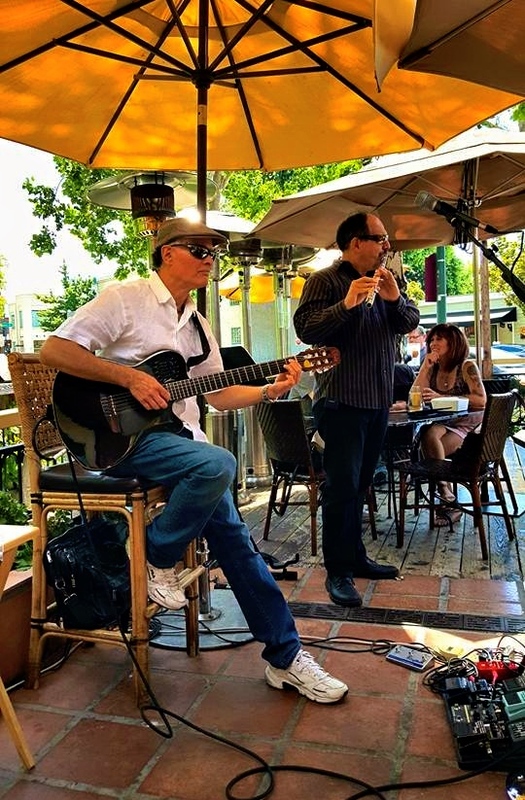 I wrapped up another jam-packed week with an intimate patio performance on Sunday September 11 at Maria, Maria in Walnut Creek. The full, attentive patio (and even those inside) were receptive to an impromptu musical tribute to the significance of the day. I allowed the gentle wind to select the songs from my book for my 9-11 segment and shared them with the audience. From Stevie Wonder to John Lennon to Djavan and beyond, the wind chose songs I hadn’t done before and the lyrics, mood and passion were perfect for the moment. Very special. One never knows what’s going to happen from gig to gig. Every day is different. I enjoyed a great private concert up in Oakville on Friday with my talented friends Carlos Reyes, Janice Maxie-Reid, Estaire Godinez, Gary Brown and myself. We created stirring and entertaining moments. And on Saturday, at Pairings Cellars, a unique version of my Trio — drummer Celso Alberti, bassist Dewayne Pate and myself— surprised and excited the Pleasanton audience with forms of music they weren’t used to seeing there! Hell, I even surprised the band with some of the tunes I called out. Several we had never done before, but I wanted to take advantage of the talent. We hit them strong. This week I have some big private weeknight events with my band in store, alongside solo public appearances Tuesday at Maria, Maria in Danville, at Don Pico’s Friday, Barone’s Restaurant on Saturday Sept 17 and Maria, Maria in Walnut Creek on Sunday. Details below. Remember, too, to make your reservations for the annual fund raiser put on by my beautiful friends at Sionfonds to benefit the children and their families in Haiti. It happens next week on Sunday Sept 25 from 4-8pm at Venga Paella in Oakland. These people really do exceptional work, have big hearts and kick it all off from right here in Oaktown. It’s a great night out with authentic paella dinners, sangria and other libations, Haitian crafts, and I’ll be providing the musical sound track. I urge you to click on their site to learn more and make your reservations. www.sionfonds.org. You can also reserve here: http://www.pingg.com/rsvp/pk8a76g22yq3zbkhp. Previous PostPrevious Norah Jones will release her new CD, Day Breaks, on October 7th, 2016.